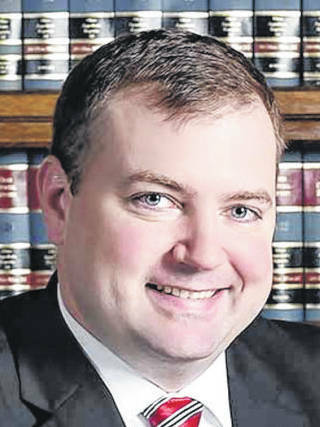 GREENVILLE — Another local attorney is hoping to receive the Republican Party nomination for Greenville city law director. Michael A. Rieman spoke to The Daily Advocate regarding his candidacy for the position. Currently, he is one of two candidates — including Darke County Assistant Prosecuting Attorney Jesse Green — who have filed petitions for the May 7 primary. Though working as a director and partner at the law firm of Dungan & LeFevre in Troy, Rieman is a resident and native of The Treaty City. He received his bachelor’s degree from The Ohio State University in 2008. His other law experiences include his own legal practice as well as time at Bieser, Greer & Landis and Marchal & Marchal. He also had a 10-month stretch in 2015 at the Darke County Prosecutor’s Office. Rieman said his experience with litigation has given him insight into helping cities and clients avoid lawsuits and trials. “Unfortunately, handling and dealing with lawsuits is a very expensive thing, and to the extent that you can avoid them, that’s usually the best practice,” he said. Asked why he hopes to be elected law director, Rieman said he feels invested in the long-term success of Greenville. Unlike Green, who, if elected, said he will consider the law directorship a full-time position, Rieman said he will split time between the city and Dungan & LeFevre. This entry was tagged City of Greenville, election, Greenville, Law director, Michael A. Rieman, Michael Rieman, Republican, Republican Party. Bookmark the permalink.